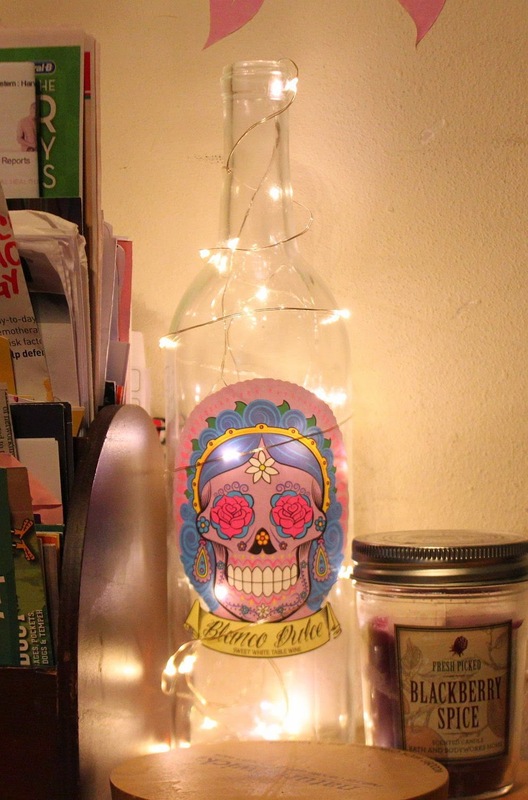 Beautiful Incentives: DIY Lighted Wine bottles for New Years. No drilling required! DIY Lighted Wine bottles for New Years. No drilling required! I was researching ways to make lighted wine bottles and all the ways I found required you to drill a hole in the bottle for the wiring to go through or other ways that weren't as eye catching and pretty. I really wanted that look, without having to drill holes, so I decided to use some battery operated led lights that I had purchased recently for Christmas. These lights are perfect for making lighted wine bottles, as they are small and on wiring that you can manipulate inside and around the bottle. It's ridiculously simple! This is PERFECT for outdoor entertaining, as there are no plugs involved! First, I took the bottom of the led lights and started to maneuver the wiring the way I wanted the light to hit the inside of the glass. So basically getting one light to go on either side and in the middle as I went up. Then I took the remainder and wrapped it around the bottle until I got to the bottom. You must do it from the top in order to disguise the wiring when you are done. When done, I just tucked the battery pack and wiring behind a few things and voila. It's simple festive and most importantly, does not break the bank! Pretty Wine Bottle. I used this Limited edition Halloween Dia De Los Muertos wine bottle that I saved from World Market. Decoration to disguise wiring or you can even string the rest of the wiring into another bottle or along the wall. I just liked the look of it wrapped around the bottle and out of sight. UPDATE: You can skip trying to hide the hideous battery pack and just get these awesome Wine Bottle Cork lights!! Set two bottles on either side of a large punch bowl or raised appetizer plate. Line up the bottles side by side in a row and place flowers in between each one to disguise the battery packs and wiring. Set the bottle into a holder that rises up a few inches and hide the battery inside the holder. Think rustic boxes etc. Simply don't disguise the wiring and have it stringing everywhere on the wall above the bottles! This is a perfect DIY for a New Years party or any party. Buy several led lights and bottles in different colors and go crazy with it!